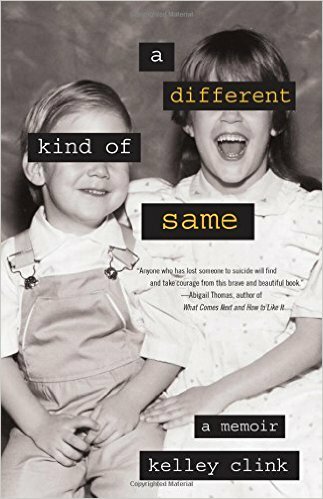 Kelley Clink is the author of the new memoir A Different Kind of Same, which focuses on the impact of her brother's suicide in 2004. 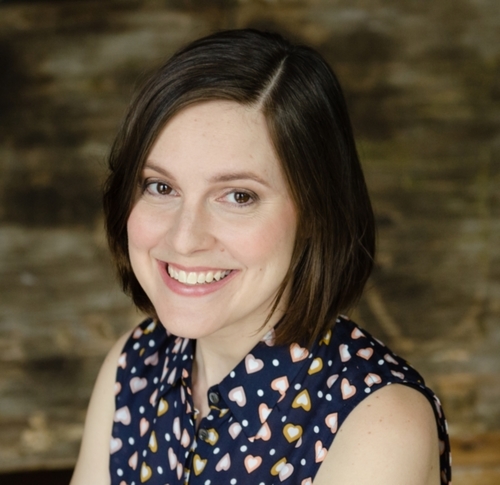 Her work has appeared in a variety of publications, including The Huffington Post and Gettysburg Review. She also is an advocate for mental health and suicide prevention. She lives in the Chicago area. Q: You write, “I know now that sharing my story, baring my metaphorical notebooks for all to see, has transformed the way I see my illness and myself. It’s also been a necessary element in resolving my grief.” How did writing this book help you, particularly in the aftermath of your brother’s death? A: At the time of my brother’s death, my life was “together.” I was married, working, had two college degrees and a home. I was still deeply ashamed of my depression and hiding most of my struggles, but I wouldn’t have said so. It was something that I did subconsciously, and I’d gotten very good at it. My brother’s death shattered that armor. Grief stripped me down to my rawest self, and I had no idea how to handle everything I was feeling. Actually, I didn’t know how to handle anything I was feeling. And I didn’t know how to talk about it. I was terrified to talk about it. I’d conditioned myself to hide messy and complicated emotions for so long, I was sure that anyone who knew the depth of my grief would turn and run from me, screaming. Writing broke those big, messy, complicated emotions into manageable pieces. It helped me get some of the chaos out of my head. But most important, when I found the right words for those feelings, when the words came from my fingers instead of my mouth, they were much easier to share. Q: You share some very personal and painful details about your relationship with your brother before and after his death, and about your own struggle with depression. How difficult was it to revisit these experiences as you wrote the book? A: Very. I knew as soon as my brother died that I wanted to write about him, but for the first two years I wasn’t able to. The grief was too hot and too sharp to touch. But, of course, the more I tried to avoid my grief the larger it swelled. By the second year after his death it had grown so big it eclipsed everything else. I quit all my jobs. I isolated myself from friends. There were some days I couldn’t even leave the house. I knew then that I didn’t have a choice—I was going to have to write my way through. I’ve likened it to digging glass splinters out of my heart with my bare hands. On the good days, I spent a few hours reading his journal, combing my memory, and writing a few pages. On the less good days I wrote about how hard it was, how angry I was, how tired I was, how little made sense. On the bad days I cried. And on the really bad days I stayed on the couch after lunch and watched reruns of Law & Order until the sun set and my husband got home from work. That was my routine for about four years. The good news is that, by the end, I’d learned a lot about self-care and I’d worked through most of my grief. Q: What has been the reaction among your family members to this book? A: My parents and husband knew I was writing early on, but I didn’t share pieces with them at first. Once chapters started getting published by literary journals, I knew I had to show them. To my great relief and gratitude, they have been nothing but supportive throughout. My extended family has been great, too. I have tons of aunts, uncles, and cousins, not to mention my husband’s family, and everyone has been tremendous. I almost feel bad saying that, because it’s so boring! Q: How did you decide on the book’s title, and what does it signify to you? A: I worked on this book under a different title for many years. One day “A Different Kind of Same” just popped into my head. It felt like a perfect description of what it means to be a sibling. You have the same genetic make up (if you are biologically related). You share the same parents and the same house (sometimes even the same room). You eat the same food. Watch the same movies. Go to the same schools. You experience all these similar places and people—and yet, you experience them differently, because you are different. Your memories are different. Your opinions. Your likes and dislikes. Your talents, your dreams, your perceptions. In my case, my brother and I had this extra layer to our story. We were both diagnosed with mental illness as teenagers, and there were many similarities in our journeys (including nearly identical suicide attempts). But our illnesses and outcomes were completely different. Funny enough, the title ended up being the last words of the book. It’s almost as if I wrote my way up to it. A: I recently became a mom, and I’ve been enjoying writing about mental health and parenting. That’s been a pleasant surprise and a nice change of pace. I do have an idea, and a lot of material, for another memoir. Hopefully in the next year or so I’ll be able to sit down and start sorting through all that. A: Sept. 10 is World Suicide Prevention Day, and on that day I’ll be donating 30 percent of proceeds from A Different Kind of Same to the Alliance of Hope for Suicide Survivors. Just make sure to send a receipt to cassie@sparkpointstudios.com!